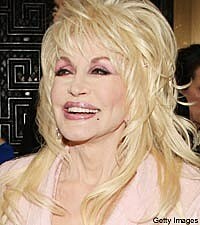 Dolly's hugely successful 2008 UK tour will be documented in an upcoming DVD release. 'Dolly Live in London' is set to hit stores in November and will spotlight many of her most recognizable hits, including 'Jolene' and 'Coat of Many Colors,' accompanied, naturally, by Dolly's unmistakable wit and homespun wisdom. In July 2008, the London Times newspaper raved, "Dolly Parton sang beautifully and accompanied herself with an able touch on guitar, piano, violin, banjo, harmonica, dulcimer, tin whistle and tambourine. And at regular points during her two-hour performance in Glasgow, she pulled out a succession of hits from one of the great songbooks of the country-pop era: 'Jolene,' 'Islands in the Stream,' '9 to 5,' 'Coat of Many Colors' and a show-stopping 'I Will Always Love You.'" In other Dolly news, the singer-songwriter recently released the official cast album for the Broadway hit '9 to 5: The Musical' -- for which she wrote all the songs -- on her own Dolly Records label. She's also recently undergone a facelift -- of her official website, that is.